Received email from a new organization spearheading revitalization for New York Avenue in the Northeast quadrant of DC. with an upcoming meeting on Thursday January 29th. Traffic volumes on New York Avenue, circa 2000. Generally, the corridor has been marked by the reality of its serving as a traffic-engorged entry in and out of the city, serving as a connection between the Baltimore-Washington Parkway, I-95, and Rte. 50 and I-395 in DC and Virginia. That makes it pretty grim. Plus it's bracketed by train tracks and a major train yard on the north side. A Costco opened in the corridor a few years ago and does very well, but while satisfying consumer demands, doesn't make the corridor look any better. In general, the New York Avenue corridor doesn't offer much in the way of high quality placemaking or entryway characteristics. 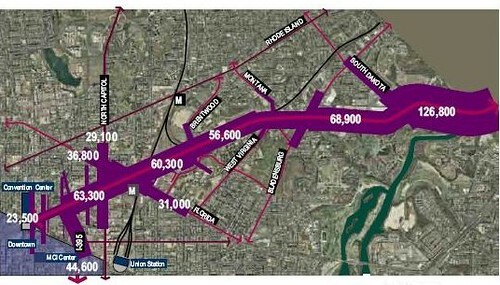 The city did a plan in the early part of the last decade that had some great ideas, and addressed the entirety of the corridor from the DC-Maryland line to where it joins I-395 around 3rd Street NW. After this there was an attempt by Abdo Development to develop a big section of it, between Montana Avenue and Bladensburg Road, but that fell through after the 2008 real estate crash. Another plan for that section was for a Walmart-anchored shopping center, which also fell through. Since then, the prominent local real estate development firm, Douglas Development, has made a big investment in buying the historically designated art deco Hecht's Warehouse and a lot of the adjoining properties, including the 17-acre section once controlled by Abdo Development. I don't know the exact amount, but it must be in excess of 50 acres. 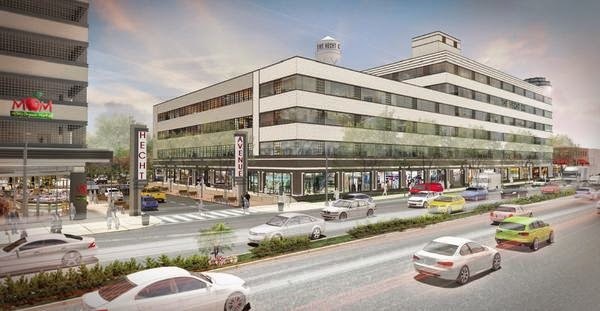 They are converting the Hecht's into apartments, with retail on the ground floor and in adjoining buildings. I think they are somewhat "crazy" a/k/a "ahead of the market," because the area is somewhat of a no person's land, distant from quality transit and definitely not particularly "walkable" and automobile-dependent. That will change as more of the area gets repatterned. Rendering of a DMU unit in MBTA Boston livery from BostonInno. Note that this shows the possibility of a single railcar powered by electricity, which is more efficient than diesel. A DMU integrates the engine into a single car, allowing for significantly smaller train sets and more frequent service. And as residential development and activity increases, an idea I once saw as crazy, adding an infill MARC railroad station at Bladensburg Road ("McDuffie suggests a Bladensburg Rd MARC or Metro station," BeyondDC), starts to make sense. Especially if it were possible to provide a type of transit service using Diesel Motive Units, something Boston is pursuing for one of its city-serving lines ("MBTA to purchase new trains, open new Blue Hill station," Boston Globe). This would allow for more frequent service, treating the railroad line as a kind of more frequent subway line, providing a type of fixed rail transit service that the corridor doesn't enjoy now. A MOM Organic Market opened in November 2014 and despite my questioning the likelihood of success ("Sometimes a bad idea is just so obvious: MOM organic grocery on New York Avenue NE") allegedly it is already one of their highest-performing stores. Other retailers and restaurants are announcing plans to open there. Although my understanding is that retailers are getting sweetheart deals, which makes sense, because the retailers are taking big risks by locating there now, when the base of immediately located customers is low and most people will have to drop to shop there. 2. 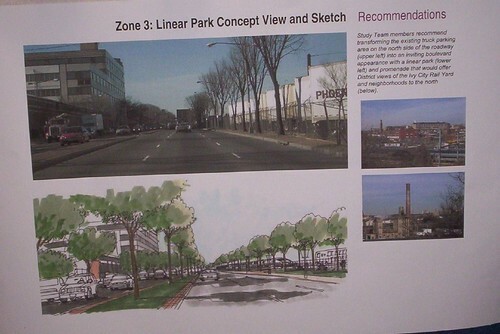 Interestingly, I would argue these plans are somewhat counter to the recently produced Ward 5 Industrial Land Transformation Study, which recommended that industrially zoned land in the ward be preserved to support provision of space for "production, distribution, and repair" businesses, as well as the development of the creative economy by providing access to flexible spaces and artisanal production of food and beverages, as well jobs preservation and development. These projects subtract 5% to 10% of the ward's industrially-zoned land in one fell swoop. I believe that got the same email last week to. Too bad their web site is so difficult to read with needless background graphics making the text almost invisible. I was gonna comment on the poorly designed website, but then I thought it would be a bit gratuitous. The email had way too many fonts and design treatments too. 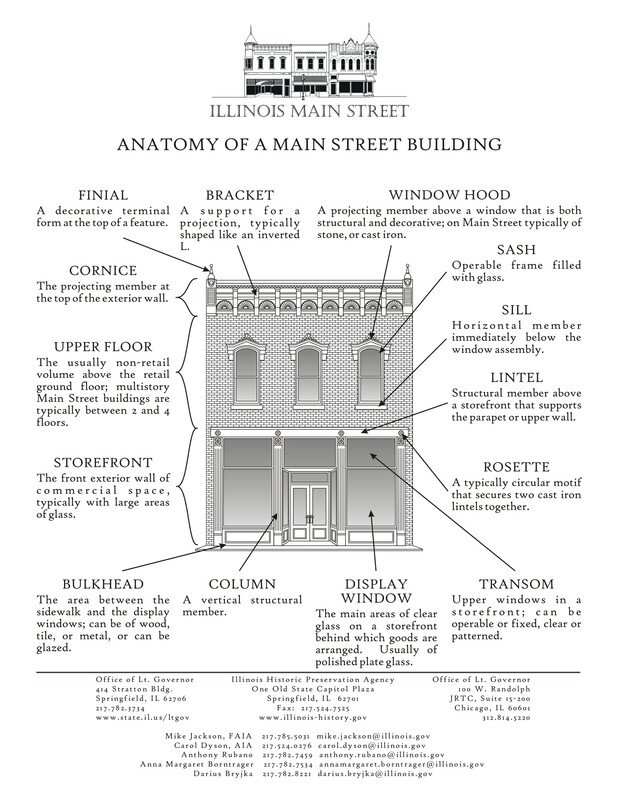 ... like when the Macintosh first came out and people would produce a flyer using dozens of fonts, dingbat symbols, etc. It's been a long time since I've been in that area between NY Ave. and RI Ave. I think your question has a great answer: both, which is not what had been proposed before. If you had DMUs (or preferably in this case EMUs) running between this area and Union Station, as a kind of DC equivalent of the London Overground, you could have two stations, one in the vicinity of Bladensburg, and one more directly serving "the Hecht District." But with traditional MARC service having two stations over such a short distance wouldn't make sense. What I am thinking of is more using the tracks for intra city service, not so much it being MARC service per se. The thing about this area and MARC is that MARC is about moving commuters between, in both directions, Baltimore and DC. But I think the London Overground idea works better, if it could be pulled off. Most of the stations on the Camden Line between DC and Baltimore don't get a lot of usage. So maybe a station here would have a comparable level of ridership. But from MARC's standpoint, the area isn't a job center, and likely would generate few riders going north. ... although the tracks are just north of Bladensburg Rd., and are close enough to the intersection with South Dakota Ave. that it could be a similar kind of station there, serving the Ft. Lincoln area. I don't know the track configuration well enough to figure out whether to use the Camden track or the Penn line tracks. FWIW, sometime in the next couple months I will be doing a big piece on Union Station, and a key aspect of the discussion will be how Union Station can be the fulcrum for merging MARC and VRE into one integrated service. But it will also explore these kinds of ideas, and thank you for bringing this up, because I wouldn't have thought about more nuanced Overground service including Ivy City if you hadn't suggested it. There's huge potential with regard to decking that enormous railroad chasm. I say deck it over, add a street grid and of course include box tunnels for both a WMATA line and an eastern extension of I-66. The studies from a decade ago were wasteful in only considering highway tunnels directly beneath New York Avenue, rather than the strip of paring lots along its northern side. From there, build a freeway tunnel box and extend the lid across the railroad with the new WMATA line, a linear park and lots and lots of new buildings. Way more development potential than what they will get with chocking the B&) JFK proposed I-95 corridor and doable without chocking transportation improvements. I look forward to your Union Station article. Then, build a street grid atop the massive industrial areas to the south of Rhode island Avenue. Plan for a future extension of the monumental core of Washington DC rather than this haphazard neo medieval-ism that now plagues the area. build the highway tunnel extension to connect with the center leg via what I devised rather than the 1971 or 1996 plans, thus improving geometry while reducing housing displacement from 600+ to as few as 33.